Secondary sources are resources that you can use to aid your understanding of the law but are not themselves considered law. There are several different types of secondary sources, including books (sometimes called "treatises"), articles, encyclopedias, and form books. For most people, this is the best place to start your research. Look for articles or books by reputable authors who are law professors, attorneys or judges. Read the article carefully. The closer that the facts in a case mentioned in the article match your situation, the more likely the case will be helpful to you. The benefit of using an article/book to start your case research is that the author has presumably done some analysis and research on the topic. Make sure to look at when the article was written. If you are looking at a print book, check the supplement date or pocket part date (located in the back, inside cover). You can assume that the author last did his/her research about a month or two before the publication date. No cases since that day have been updated or included. Keep in mind that interpretations of the law found in secondary sources are not binding on the courts. Only use secondary sources to help you find and understand the primary sources of law (statutes, regulations, and cases). When trying to find answers to your legal questions, you should always read the actual statutes, regulations, and cases that are discussed in these secondary sources. The methods used to find secondary sources by subject vary depending on which type of secondary sources you are looking for. For example, if you want to find books about divorce law in Maryland, you should probably begin by searching a library catalog. On the other hand, if you want to find journal articles about divorce law in Maryland, you need to use a periodicals index, because searching the library catalog would only tell you which journals that library has, not what articles are contained in each journal. 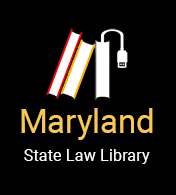 Find law libraries in Maryland. Finding a book on the area of law you are researching can be an excellent first step in legal research. In particular, practice guides and continuing legal education texts for attorneys can be surprisingly helpful to non-lawyers representing themselves. They often contain explanations of the meanings of various laws, as well as practical aides such as checklists (for example, lists of questions to ask witnesses or lists of steps to be taken before you file a court complaint) and forms. Tip: When you need the name of a book/article on your specific subject of law, the best way to find the book you need is to search a library catalog using the "keywords" field, rather than the subject field. When you do a keyword search, the computer looks for all the words you’ve included in all parts of the catalog entry for each book, including the subject and the title. This increases your chances of finding a relevant book. A good example of a keyword search for state-specific books that include forms is divorce Maryland forms. You can easily adapt this search to other subjects and jurisdictions. For example: custody Virginia forms or civil rights federal. Using forms can be problematic for a non-lawyer. Forms are useful when you are unsure of the format or content required for documents that you are submitting to the court. Be careful when using forms because they are based on someone's review of the statute and the court's procedural rules and may not be entirely accurate. Generic forms can only give you general guidance on what should be submitted to the court. Use them carefully. You may wish to consult an attorney after you have completed an unfamiliar form. Many attorneys (although not all) will review a form for you for a minimum fee, even though you do not hire them to represent you. A notable exception are the Domestic Relations forms prepared by the Maryland Courts for the members of the public who choose to represent themselves. Form Booklist - If the books you find on your subject don't include adequate forms, there are two major sets of form books to look for: American Jurisprudence Legal Forms and West's Legal Forms. Both sets have a subject index that allows you to find sample form language by topic. Be careful when you use forms from these sets because they may not satisfy the law of your state. You should always research your state's legal requirements for the type of document you are trying to write and then adapt any sample forms you find to those requirements. One of the easiest types of law-related secondary sources for the public to use is the legal encyclopedia. Legal encyclopedias work like regular encyclopedias. General legal information - There are legal encyclopedias that discuss American law in general, including federal law and the most common types of state law. These are called "national" legal encyclopedias. The two most popular national legal encyclopedias are American Jurisprudence and Corpus Juris Secundum. Most law libraries carry one or the other, if not both. American Jurisprudence and Corpus Juris Secudum both give general overviews of the law, which are based on the legal rules applicable in a majority of U.S. states. Maryland specific legal information - There are also state-specific legal encyclopedias, which focus on explaining the law of a particular state. One example is the Maryland Legal Encyclopedia. Tip: If you are researching a state law problem, such as divorce or custody law, it is best to use a state law encyclopedia. A state law encyclopedia will be more helpful because the law of your state may be different from the "majority" rules typically discussed in the national legal encyclopedias. How to use a legal encylopedia - Each legal encyclopedia has many volumes, and has a subject index near the end of the set of volumes. To find encyclopedia articles by subject, look up words related to your problem in the subject index. You will be directed to a topic and section number. Find the volume of the encyclopedia that includes the topic to which the subject index directed you, then look for the specific section number within that topic. Books and legal encyclopedias cover a broad range of subjects, but are usually not updated more than once a year, and may be updated even less often. To find more current information, it is probably a good idea to look for journal articles. There are many different subject indexes to legal periodicals. Some are in print, and others are electronic databases. Probably the most popular electronic index to legal periodicals is called LegalTrac. Many general public libraries, as well as many public law libraries, subscribe to LegalTrac, and a reference librarian can show you how to use it. Unfortunately, there may not be any journal articles about your specific legal problem.